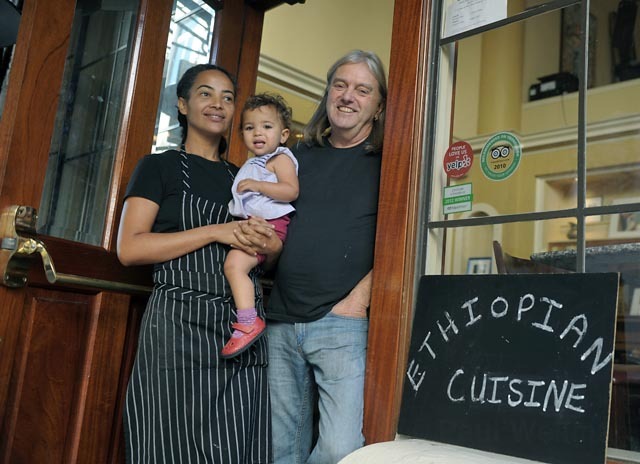 It’s a family affair at Petit Valentien with Serkaddis Alemu, Robert Dixon, and 15-month-old Nib. Serkaddis Alemu, despite having lived in the U.S. for nearly two decades, remains Ethiopian at heart. She admits, “If you sit with any Ethiopian for long, don’t be surprised if the discussion ends up about food. To know the food is to know the people.” She’s helping Santa Barbara know both the food and the people, serving Ethiopian lunch on the weekends at Petit Valentien, the restaurant owned by her partner, Robert Dixon. Alemu points out that she’s cooking merely a fraction of her country’s cuisines, mostly food from the north where her family is from (in Ethiopia, there’s really not a single cuisine, even though many stews are lumped under the term wat), though not necessarily the same way. The menu is new each week, generally featuring four or five vegetable offerings and three meat or fish. Alemu is particularly pleased with the ingredients she gets to work with, from fresh Farmers Market okra and eggplant to spices from Vices & Spices. Then there’s injera, crêpe-like flatbread that Alemu quickly points out “is not bread; injera is injera. We make bread and call it dabo.” To make injera,, she sources teff, a species of lovegrass, from Idaho. “To tell you how to make injera would be like telling you how to cure the hiccups,” she says. “Everyone has their own way, and you can use up to five types of flour. The bottom has to be like a crêpe” — remember this is food no more than a quarter inch thick — “the top like a honeycomb texture to bond with the stews you make. The honeycomb, Ethiopians call it the ‘eye.’ People will call and ask, ‘How was your eye?’” Alemu jokes it would be worth developing a website, as Ethiopians in the U.S. call each other so much to consult. Alemu’s weekend venture doesn’t have its own name; it’s just another variation of Petit Valentien. And that can only mean good things — that refined wine list (with gems like Bonaccorsi Syrah by the glass), a trio of good beers on tap, and lovely French desserts (sweets aren’t an Ethiopian thing — they put salt in their coffee) are all PV touches. After all, Petit Valentien is the kind of bistro you might find off a main boulevard in Paris — homey, almost clubby, with its wood-featured interior and close tables. And then the food: way better than you might imagine; start with the mushroom crostini, and you will imagine magnificent things. Owner/chef Dixon has created a French-ified oasis in La Arcada, and Alemu’s addition of Ethiopian weekends only makes the spot more cherished. “I remember growing up in Ethiopia and the conversations claiming if a woman can’t cook, she can’t marry,” she recalls. “My aunt from the country would visit us; she was surprised I was 7 years old and didn’t know how to butcher a chicken.” Clearly, her aunt didn’t have to worry. Stuff yourself with savory Ethiopian stew made by Serkaddis Alemu at Petit Valentien, Saturday and Sunday, lunch only, 11 a.m.-2:30 p.m., at 1114 State St. in La Arcada. Call (805) 966-0222.